Fungus gnats are a common problem for soil marijuana growers, but if you know what to do they’re actually easy to get rid of. Fungus gnats are extremely small (two millimeters in length) and are gray, black, or brown in color with long legs. Female fungus gnats lay two hundred eggs per week, and they are often laid towards the bottom of your marijuana plants. The maggots of fungus gnats have black heads and transparent bodies, but they are microscopic. Both maggots and adults attack marijuana plants. 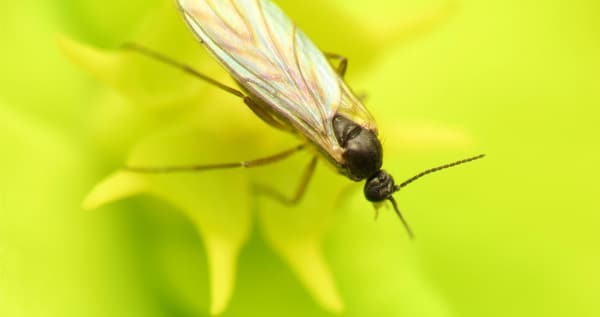 This article will teach you how to fix your current fungus gnat infestation and make sure you never get fungus gnats again. Fungus gnats got their name because they feed on fungus at the soil level. When they have no more soil, they start working on your plants’ root systems instead. They consume the small root hairs and cause damage to the bigger roots. This affects the speed of your plants’ growth, turns leaves into different colors, and causes stems and branches to grow abnormally. The major problem with fungus gnats is they allow your plants to be particularly vulnerable to lots of different fungal diseases. Fungal gnat droppings are one of the things that cause major problems for your marijuana plants. The droppings, left in the soil, will affect your soil’s drainage and will, therefore, keep the soil too moist. This, in turn, attracts more pests that like the moist environment. Make sure you don’t get a total infestation by being careful not to water your marijuana plants too much. Fungus gnats are attracted to your valuable plants in the first place by wet soil and decaying organic matter. This means that overwatering your plants or allowing the dead plant matter to rot will cause fungus to grow. This is often impossible to see with the naked eye – which in turn will invite fungus gnats to come feast and lay eggs. You will notice these tiny black bugs flying around the plants as well as crawling on the soil next to your plants. You may also see the little white or transparent larvae wriggling around in the soil. They are really small and will only look like minuscule white spots in the upper layer of the soil moving around. They may seem small, but they can do some big damage to your plants. If you think there might be a gnat problem, there are a number of ways to check and be sure. There should be yellow sticky cards available at your local garden center or online at this link here. They should always be yellow because gnats are attracted to that specific color. Buy some of these and put them on the ground, in the soil near your plants. Check these cards a few days later. If there are a high number of gnats stuck to them, you have a problem. You can also check for the gnat larvae by using a potato. Cut a potato into half an inch deep, and stick it into the ground. Check back several hours (between four and eight hours) later to see if maggots have infested it. If there are a number of maggots there, you need to deal with the problem. As far as plant symptoms go, the hungry gnat larvae that chew on your roots will cause a number of plant issues. If your plant is very young or the gnat infestation is bad enough, it could result in the death of one or more of your marijuana plants. Before that you will see signs of slowed growth and leaf problems. 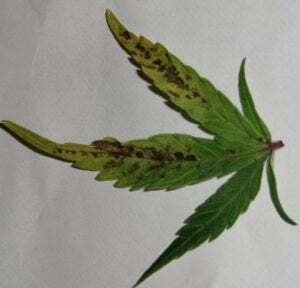 Sometimes symptoms of nutrient deficiencies will occur but without explanation, since the pH level, nutrients, and other nutrient-related issues are clearly not the problem. Fungus gnat larvae generally affect younger, more vulnerable plants, but sometimes they can have big effects on mature plants, as well. If the infestation hits your plants right when they are in the flowering stage, the end yield could be decreased significantly. It’s important to note that the fungus gnat larvae are not the only source of trouble for your plants. Adult fungus gnats often spread plant diseases with their feet, such as pythium. Pythium, as you may already know, is one of the main causes of root rot. Since prevention is the most effective way to deal with any problem that could harm your plant, you will need to make sure you don’t ever overwater your plants. Whether it’s before your very first growing season or your seventeenth, you need to do your best to prevent a fungus gnat infection. If your last growing season had a gnat problem – even a small one – you need to ensure that the growing area is cleaned out completely. If you’re growing indoors, make sure you don’t have any houseplants with fungus gnats or larvae of any kind near them. If you’re receiving marijuana clones from elsewhere, you have to be absolutely certain that they don’t have any fungus gnats, spider mites, or other pests. If you are at all concerned about bugs being a problem, you should probably just grow your marijuana plants from seed. Clones are the easiest way of spreading pests to new crops, especially when you are growing indoors. Even if you have seen gnats flying around your plants, but the infestation hasn’t had any visible effects on your plant yet, it’s important to deal with the problem as soon as you notice fungus gnats. You can try trapping the adult gnats by placing yellow sticky tape (available here)or sticky cards all around your garden. Gnat larvae, on the other hand, pose the real problem. First of all, make sure the top several layers of soil are allowed to fully dry. You will have to pause your normal watering schedule for a couple days – but it’s worth it. When the soil has dried, make a mixture of 3% hydrogen peroxide and water at a 1:4 ratio. This won’t injure your plants, but it will turn into oxygen and water (that, as you know, are beneficial to the soil). This will keep the gnats away while simultaneously helping your plants out. To help speed up the process of ridding your plants of this pest, bring in a fan and have it blowing over your soil to help dry it up more rapidly. It also helps keep the tiny fungus gnats from flying around properly, therefore reducing the amount of eggs they are able to lay. A commercial product like Bug Blaster will always to the job. If you want to make sure to kill them all buy something like Bug Blaster. Another way of destroying larvae that are living in the soil is using an actual pest treatment that contains the Bacillus thuringiensis bacteria. Bacillus thuringiensis sometimes referred to as “BT” or “BTi,” is a type of bacteria that creates a larvae-harming toxin. It essentially disallows them to eat. The great thing about this bacteria is that, while it wreaks havoc on the tiny larvae, it won’t cause any problems for your plants or their roots. It also poses no threat to your own health. It is highly selective with where it focuses its harm – and it focuses almost exclusively on larvae. Make sure to crush the little pellets that you can buy and then sprinkle the resulting powder onto the soil from there. Dry formulations generally function better than liquids. When you do use this treatment, water your plants plenty afterward. This is a substitute for the hydrogen peroxide/water mixture that was described above. Once you have eradicated the fungus gnats from your garden, make sure to change your watering habits. Clearly you were overwatering, since that is what must have attracted the fungus gnats in the first place, so make sure to avoid this in the future so you won’t need to deal with another fungus gnat infestation – or worse. You can keep using those yellow sticky cards to find out what the current status of the infestation is. If it has lowered, there will be fewer fungus gnats caught in the trap – and vise-versa. Don’t relax until you have hard evidence that the infestation is really gone. This could take a couple days, or it could take a few weeks! Don’t lose hope, and keep a careful eye on all the goings-on of the yellow sticky card as well as your garden itself. It is somewhat common to discover fungus gnats and their larvae in your compost pile. It is something that you need to pay special attention to since compost is supposed to be there to make your plants strong and resilient – not destroy them from the roots up. So how do you deal with a fungus gnat problem in your compost? First, you need to ensure that your compost pile isn’t too moist. Excessive moisture is the primary reason for fungus gnats appearing in your compost pile, so take this piece of advice very seriously. A good rule of thumb is that compost piles shouldn’t seem wet, but they should be similar in moisture to a sponge that has been squeezed out. If you do discover those pesky larvae in your compost pile, you should try sprinkling food-grade Diatomaceous Earth over the exposed parts. This will cause no harm to people, but will kill off larvae and adult fungus gnats. If the problem is particularly extreme, try a pest treatment that has bacillus thuringiensis in it. Mosquito Bits or Mosquito Dunks are some examples of brands you could try. Use a dry formulation of this product rather than a liquid; break the pieces into a finer powder and sprinkle that over your compost. Then you add water (contrary to what we just told you about compost moisture levels), which will activate the treatment and will kill off the larvae. Once you have allowed your compost pile to dry out enough, make sure to cover it up with some sort of plastic covering or tarp. If nothing else, this will mess with the fungus gnat life cycle, further weakening them and slowing down the infestation. Another way of accomplishing the same thing is covering it with a material containing plenty of carbon. Some examples of this are cardboard, shredded paper, or brown leaves. If possible, you should have a lid over your compost bin from the beginning, therefore preventing the infestation from happening at all. To really prevent this, do not add your kitchen scraps to the compost pile if you’re going to be using it for marijuana plants. The best marijuana growth comes from compost that has been maintained properly. This means avoiding kitchen scraps or burying them in the middle of the pile so fungus gnats or other pests can’t reach it. Ensure that your compost pile is turned over often and consistently, therefore allowing it to dry out enough and keeping everything mixed up. This also will keep the fungus gnat larvae from getting too problematic, in case they have already found their way to your delicious compost pile. If the compost is maintained correctly, it will increase significantly in temperature. This, finally, will roast the remaining larvae, causing them to certainly meet their demise. Fungus gnats are commonly mistaken for fruit flies – make sure you are aware of which one is buzzing around your marijuana plants. Fruit flies and fungus gnats have very different behaviors (and, therefore, different deterrents), so it’s important to know which one you are dealing with. Fruit flies have bodies that are brown, yellow, or orange in color; fungus gnats are gray, dark brown, or black. Fungus gnats will appear particularly tiny to you while fruit flies are generally larger and easier to spot. If your problem is due to fruit flies instead of fungus gnats, you will need to take a different approach to ridding your growing area of them. They are attracted by ripe or rotting fruit (thus their name), as well as improperly composted soil that has your kitchen scraps in it. If you take this food away from them, they will also go away. Remember that plants with strong genetics have less change of getting sick and are less vulnerable for pests and diseases. So make sure to buy cannabis seeds from a trusted seed bank.